Paper bag with embedded cardboard hangers Where did all the hangers go...? They're never enough and there isn't one around when you need it ! Well, that's about to change! 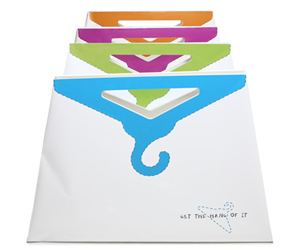 The "get the hang of it" bag is made of recycled/recyclable paper and cardboard.Rip the two cardboard hanger off the paper bag and your new clothes will find their place in your closet at once. Just "get the hang of it" ...!